I had the opportunity yesterday to hear a lecture at the University of Sydney by visiting academic Emeritus Professor Nicolas Wyatt of the University of Edinburgh. Professor Wyatt is especially known for his work on understanding the Bible in its ancient cultural context, especially the finds from the north Syrian city of Ugarit. Among his many publications is an authoritative edition of the Ugaritic texts in English: Religious Texts from Ugarit (The Biblical Seminar 53, London: Continuum: second edition, 2002). His subject yesterday was “In Search of Paradise”. In this fascinating lecture he proposed that while the Garden of Eden tends to be studied in terms of the creation and fall of humanity, that is, primordially, or in terms of human post-mortem destiny, that is, eschatologically, there is a middle ground between these two poles. He argued that the maintenance of the original garden – before the fall – also symbolised royal power and the king’s role in the ritual management of the state. He offered evidence of these elements in the biblical Eden story (Genesis 2-3), in an attempt to set the tradition within its historical context, which he claimed was the destruction of the state in 597, 587-86 BC and its non-monarchical succeeding period under Persian rule. A third way of looking at the tradition – typologically – is a subsequent construction put upon this historical perception. There were several interesting things in this lecture. Here are just a few things which I noted. English translations of Genesis 2:9 suggest that there were two trees in the middle of the garden “The tree of life was in the midst of the garden, and the tree of the knowledge of good and evil.” Wyatt argued that these two phrases are joined by a explanatory vav and would be better translated as “the tree of life was in the midst of the garden, that is the tree of the knowledge of good and evil.” Adam was prohibited from eating from only one tree (v.17). 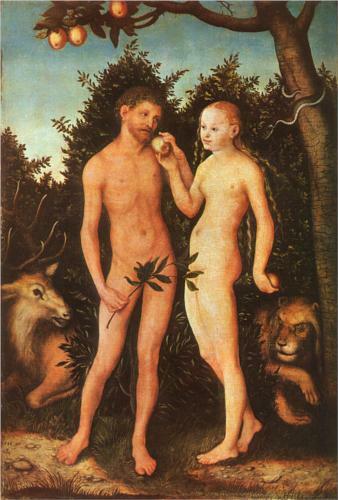 Later, when Eve referred to this prohibition (2:3), she said ‘God said, “You shall not eat of the fruit of the tree that is in the midst of the garden”‘. She did not say “one of the trees that is in the midst of the garden”, but “the tree”. This further suggests that there was only one tree in the middle of the garden, and that the tree of life and the tree of the knowledge of good and evil were, in fact, the same tree. Wyatt provided a considerable amount of evidence for placing the garden of Eden in Jerusalem (for example, a river named Gihon was one of the four rivers that flowed out of Eden and 1 Kings 1:28–40 refers to the anointing of an Israelite king at the Gihon spring). He concluded that the man in his garden is a symbolic allusion to the king in his sanctuary and that the second account of creation in Genesis is an allegory of the ‘fall’ of the kingdom of Judah and the Babylonian captivity. Having recently read David Wolfers’ argument that the Book of Job is also a metaphor or allegory of the same event, I noted with interest Wyatt’s explanation of the “dust to dust” expression in Genesis 3:19 which is alluded to in Job 42:6, and similar terminology in 1 Kings 16:2-3 with reference to the king Jehu being “exalted … out of the dust” only to be swept away [as dust]. Perhaps I will post more on this when I get hold of a copy of Wyatt’s soon-to-be-published paper.